After we have removed the water from your home, it’s time to begin the drying and restoration process. Our teams have some of the fastest dry times in the industry which ensures we limit the damage from spreading. We have the training and experience to identify moisture sources, evaluate mold growth (visible or suspected), contain damage, remove contamination and dry materials to ensure that mold will not return. . And not only do we get the water extracted, the moisture evaporated, and your property dried quickly– all of our work is done to your complete satisfaction. Our management team, office staff, insurance claims specialists, and our water damage technicians have one goal in mind-to get your home back to its original condition as soon as possible! Extraction of Water and Sewage: The first step involves identifying moisture-laden areas and removing any and all water. This includes water that is visible, as well as water that may be hiding in walls or other parts of your home’s structure. Water can be removed using high-power vacuums, water extractors, or dehumidifiers. Sanitization: Our professional home restorers will use industrial-strength cleaning agents to deodorize your home and prevent the spread of mold and bacteria. 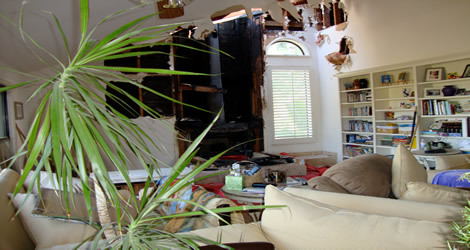 This ensures that your home will be as safe and comfortable as it was before the disaster occurred.